Cabbage rice- An easy and simple way to use up cold rice and turn it into a healthy, delectable and nutritious dish using simple ingredients. 1 tablespoon finely chopped spring onions. 1. Separate the rice grains and add the salt, turmeric, chilli powder and mix into the rice coating all the grains. 2. Heat the oil in a wok and when hot add the mustard seeds and red dried chilli. 3. Wait for it to splutter and add the shredded cabbage. 4. Toss the cabbage till it just begins to wilt and is slightly tender. 5. Add the rice and stir fry till it heats through. Tossing and turning it so that rice and cabbage blend together. 6. Transfer to a serving dish and stir in the green chillies and spring onions. 7. Squeeze a little lemon juice over the rice and serve with fresh yoghurt or raita. Lemon Rice with sweet corn and coconut. Yasmeen health Nut -Cook with cruciferous-challenge-and-cauliflower challenge. I like the idea...I did the same sometimes with cabbages, green beans and mushrooms. Simply delicious. loved this pulao.. very healthy one.. I'll be picking up some cabbage today at the store to make this. Looks wonderful! I never used cabbage in rice.This looks delicious & healthy. Simple and healthy rice..Love your version..
Oh that rice looks great! 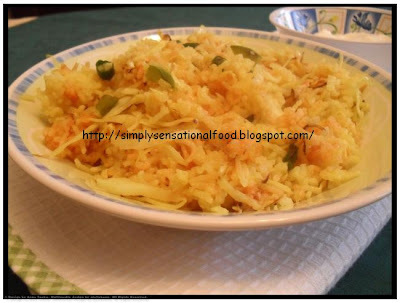 Easy and delicious cabbage rice, looks incredible.. Sounds easy, delicious, and comforting! lovely pulao....glad to knoe that ur frm uk tooo...lov ur space...thre r much new dish to me..will keep followin u! Wooow!! !dear very yummy n fluffy cabbage rice very healthy option dear..
What a great way to use left over rice !!!. Looks absolutely delicious.. Sounds yummy and healthy rice.. This is my favourite rice variety and i make this often with slight variation.. will try your method..
Great healthy recipe - I love all veg from sprouts, to cabbage and cauliflower - will try this!